Assessing the trajectory of democratization in East Asia, this volume offers a systematic and tightly integrated analysis of party-system development in countries across the region.The authors utilize unprecedented cross-national survey data to examine the institutional structure of party systems, the range of choices these systems represent, and their connection to voting preferences. They also investigate the consequences of partisanship for citizen support of the democratic process. 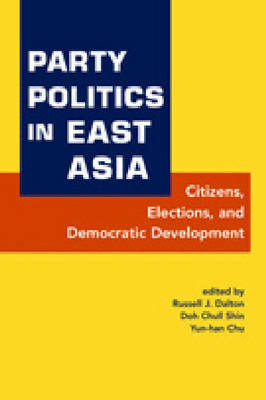 While revealing that party development in the region is still incomplete, the book highlights areas of progress as it explores the potential for enhanced representation.This is a systematic and tightly integrated examination of party-system development, in the context of democratization, across East Asia.